The MCP1603 is a high efficiency fully integrated 500 mA 2.0 MHz synchronous buck regulator ideally suited for Li-Ion/NiMH Battery powered application powered. 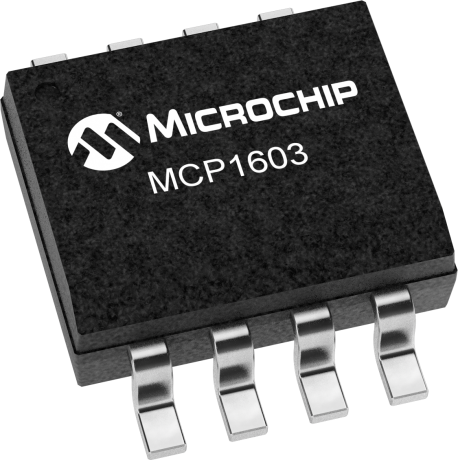 At heavy loads, the MCP1603 operates in the 2.0 MHz fixed frequency PWM mode which provides a low noise, low output ripple, small-size solution. When the load is reduced to light levels, the MCP1603 automatically changes operation to a PFM mode to minimize quiescent current draw from the battery. No intervention is necessary for a smooth transition from one mode to another. These two modes of operation allow the MCP1603 to achieve the highest efficiency over the entire operating current range. The MCP1603 Buck Converter Demo Board uses Microchip’s MCP1603 device in a step-down application. The evaluation board is a fully functional platform to evaluate the MCP1603 buck regulator over its entire input voltage, output voltage, and current range.